Spring is here and lovers of living things are eager to dabble in dirt, whether that means planting trees, shrubs, vegetables, perennials or annuals. Before you dig in, though, consider the advice of local gardening professionals who see gardeners making common mistakes year after year. They want you to succeed. Gardening is both art and science. Science dictates that a tomato plant will never grow well in the shade and a large tree won’t thrive in a small space. Don’t waste time and money trying to bend the will of Mother Nature. “Consider the light, soil and moisture conditions of a location before buying and planting,” says Sean Ducey, plant manager at Whispering Hills Garden & Landscape Center, 8401 S. Illinois Route 31, in Cary. It’s especially easy to underestimate the space trees and shrubs will require. They all look so small and cute when they’re young. Most plants come with tags that predict the plant size at maturity. Read and believe them, suggests Carlson. If temperatures dip too low, plants will start to go downhill. And a stressed plant is more vulnerable to pests and disease, says Kim Hartmann, a master gardener and landscape designer at Countryside Flower Shop, Nursery and Garden Center, 5301 E. Terra Cotta Ave., in Crystal Lake. It’s better to wait a few weeks and get them off to a strong start. It’s a cliche that holds especially true in gardening: you get what you pay for. In general, local growers want you to succeed at gardening so you’ll come back each year; big-box stores want to move volumes of product. “At a reputable local greenhouse, plant stock tends to be healthier and better adapted to our local climate, and a lot of it is grown right here on site,” says Maryann Van Laten, who’s worked for Platt Hill Nursery in greenhouse sales for 23 years. “Our plants aren’t being trucked in from the East or West Coast.” Platt Hill has locations at 2400 Randall Road, in Carpentersville, and 9394 W. Lake St., in Bloomingdale. Local growers also offer knowledge. Your garden is coming along nicely until, one sunny day, you notice a bug infestation. Professionals often have an idea of what pests to expect in a given year, based on weather patterns. Some plants are simply more prone to problems than others and can be avoided. By minimizing risk, you’ll minimize problems. Many of today’s newer plants are bred to resist disease and insects. Your garden may seem small, in the grand scheme of things, but it can have a big impact. Sticking a few milkweed plants in the ground will support monarch butterflies, which are entirely dependent upon that one plant to survive. Planting for other pollinators like bees, bats, moths and hummingbirds can help to reverse their declining populations. It’s estimated that one of every four mouthfuls of food we eat is a direct result of pollination. Disappearing habitat, agro-chemical use, disease and the cultivation of ever-larger, one-crop fields are taking a big toll on pollinators. Many greenhouses, gardening clubs and conservation organizations conduct free classes on subjects like sustainable gardening or gardening for wildlife. Check websites for schedules. People with busy lifestyles often find gardening success by containing their enthusiasm – literally. Containers, hanging baskets and raised-bed gardens make it easier to control soil composition and weeds. Kept near the house, containers may be harder for critters to raid and easier to cover when frost threatens. But it’s vitally important to keep container plants well fed and watered. Nutrients tend to wash out of containers and above-ground soil dries out faster in wind and sun. In very hot weather, a hanging basket may need to be watered twice a day. While potting soil may not seem important, it is. While it’s tempting to save money by using dirt from your yard in containers, instead of buying potting soil, don’t do it. Most of our local dirt is too clayish and hard to nurture container plants well. Most plants do fine with a general-purpose fertilizer, but some need specific types of food to thrive. Petunia varieties need more iron to keep foliage green and blooms strong, for example. Garden professionals can advise you. Investors know it’s risky to put all eggs into one basket, and so do growers, says Carlson, of J. Carlson Growers. Right now ash trees are falling faster than the stock market, due to an infestation of the emerald ash borer. “In some cases, an ash tree that’s of high value can be saved but it requires a lot of work,” he explains. Good replacement options include ginkos, maples, oaks, Kentucky coffee trees, Alaskan cedars, bald cypress, red pine, dawn redwood and various kinds of spruce, Carlson suggests. Work to have a variety of trees in your landscape. During the splendor of summer, it’s hard to imagine you’ll forget what’s happening in your landscape, but you probably will. 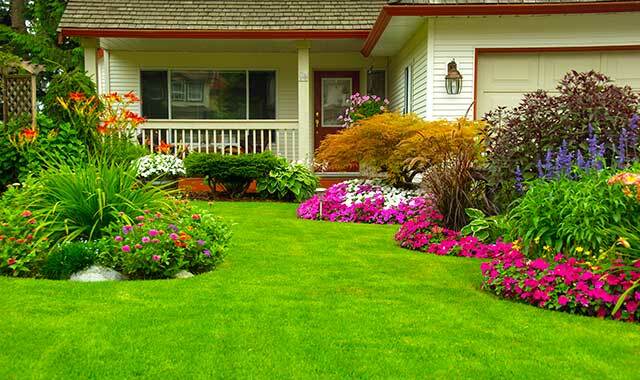 It’s a good idea to snap photos of your yard at regular intervals, including the tags that arrive with new plants. Download them to your computer, label the year and keep them with the notes you took in your garden last summer. Likewise, if you find it difficult to plan a garden that always has something in bloom, visit garden centers at regular intervals, make notes and snap photos for your reference next spring. This entry was posted on Wednesday, May 18th, 2016 at 12:00 pm	and is filed under Home & Garden, Top Posts. You can follow any responses to this entry through the RSS 2.0 feed. Both comments and pings are currently closed.